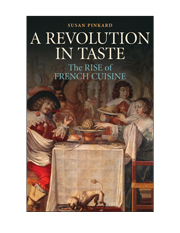 Modern French habits of cooking, eating, and drinking were born in the Ancien Regime, radically breaking with culinary traditions that originated in antiquity and creating a new aesthetic. This new culinary culture saw food and wine as important links between human beings and nature. Authentic foodstuffs and simple preparations became the hallmarks of the modern style. Pinkard traces the roots and development of this culinary revolution to many different historical trends, including changes in material culture, social transformations, medical theory and practice, and the Enlightenment. Pinkard illuminates the complex cultural meaning of food in her history of the new French cooking from its origins in the 1650s through the emergence of cuisine bourgeoise and the original nouvelle cuisine in the decades before 1789. This book also discusses the evolution of culinary techniques and includes historical recipes adapted for today’s kitchens. Part I. Before the Culinary Revolution: 1. The ancient roots of medieval cooking; 2. Opulence and misery in the Renaissance; Part II. Towards a New Culinary Aesthetic: 3. Foundations of change, 1600–1650; 4. The French kitchen in the 1650s; 5. Refined consumption, 1660–1735; Part III. Cooking, Eating, and Drinking in the Enlightenment, 1735–1789: 6. Simplicity and authenticity; 7. The revolution in wine. "Pinkard performs careful analytical work with culinary texts familiar to many food historians, offering critical readings and counter-evidence (particularly about the nature of kitchen work) to demonstrate how social practices and cultural beliefs influenced changes in taste."